On Valentine’s eve, social media in Iraq was awash with aggressive language against the ‘infidels’ and their ‘sinful’ celebrations. But in Basra where there is a majority Shia population and a full spectrum of minorities from Sunni Muslims to Baha’is, Fatima Al-Bahadly had other ideas. “It is a day to love everyone, to love peace,” said Al-Bahadly, who directs the Al-Firdaws Society, an NGO founded in 2003, and is a member of the Women’s Alliance for Security Leadership (WASL). In the morning, Al-Bahadly and her team of volunteers visited numerous churches, offering each a gift of a handmade carved wooden cross made by local craftsmen. “They were surprised because lots of Muslims would say this is haram, forbidden in Islam, and against their beliefs,” Al-Bahadly said. 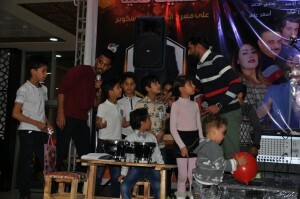 At dusk the volunteers headed to Basra’s Times Square Mall, where they had organized a carnival entitled “Together we plant love and peace”. 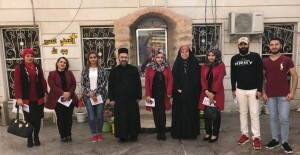 A blend of Basra families and the displaced youth from Anbar, Salah Al Din and Mosul all participated, receiving Valentine’s cards and flowers. For the first time in years, songs were played in public, and everyone joined to sing Iraqi national songs in the name of their homeland. “People were so positive about everything we did that day” says Al-Bahadly, “It left people full of joy.” She adds “I can tell you that 80% of Basra’s residents would like to visit churches and synagogues but the government stands in their way. 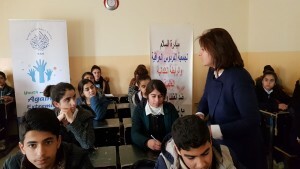 “Fatimah organizes workshops and talks at churches to establish the pillars of coexistence and spread the culture of peace among every sector of our society from students to employees and others. She knows how to touch people’s humanity,” said Emad Al-Banna, a priest from Mara Fram Chaldean Church in Basra. Reciprocally, Al-Bahadly finds the churches welcoming and helpful with any logistical needs of Al-Firdaws. Al-Bahadly is a critical voice of peace and coexistence in the midst of a cacophony of mistrust and hate. The political realm is fraught with the interference of neighboring countries that have no interest in Iraq attaining peace. And says Al-Bahadly, “The Iraqi people are suffering because of such politics”. The situation is made worse by the spread of radical ideologies by religious leaders in communities as well. Extremist preachers have a big role in that, Al-Bahadly stated. Social media is also full of incitement and hate speech, she added. “Society is where we should start, and civil society is the answer ”. A few days before Valentine’s, Al-Bahadly brought together Shia, Sunni, and Christian preachers to develop a balanced and shared message of rejecting radicalism, and respecting minorities, in churches and mosques alike. “We believe that God is love, and this is the culture we are trying to spread,” Priest Al-Banna said. Al-Firdaws’ members and volunteers themselves belong to different faiths. Ivan Faiq, a Christian volunteer displaced from Mosul, travels across the country to areas previously controlled by ISIS. To show how society can break the barrier created by war and reconcile again, she holds dialogues with Christians and Yazidis and explains how she works with an organization headed by a veiled, Muslim woman, and how they peacefully coexist. She visits schools and talk about societal reconciliation. She also holds discussions with women and mothers, whom she believes are pivotal for the pursuit of peace. “My message in life is to be one of the people who spreads peace, this is what keeps me going,” Al-Bahadly said. “They say Fatima has abandoned her religion, but I don’t care.” Says Al-Bahadly, “Our Valentines day carnival was a success. The images of people smiling and kids dancing still run in my head. That night, I went to bed feeling serene”. With Nowruz dawning and people across the region celebrating the spring equinox and the start of a new year, Al-Bahadly’s vision and mission remain ever more urgent. The Valentine’s Day celebrations were a clear reminder that the power of love, is indeed, a serious thing.